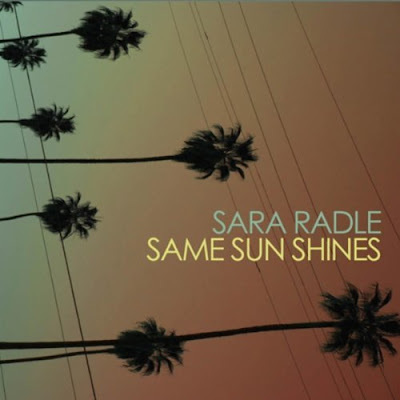 Discussions Magazine Music Blog: SARA RADLE/Same Sun Shines: Available February 21st, 2012! SARA RADLE/Same Sun Shines: Available February 21st, 2012! The story of Sara Radle’s music career is one that began in San Antonio, Texas in the late 90’s but she is probably most known for being the reason The Rentals reunited in 2005. In 1996, at the age of seventeen, she began carving out a name for herself in the Texas music scene with punk-pop trio Lucy Loves Schroeder and her own solo project. Eight years later, ex-Weezer bassist Matt Sharp played a show with her in Dallas, and very soon after, he asked her to relocate to Los angeles, CA in 2005 to re-form The Rentals. Radle and Sharp re-built the band from the ground up, wrote some songs together, recorded the group’s Last Little Life EP, and toured the world. Fans were sad to see Radle leave The Rentals in 2008, when she soon after joined Los Angeles-based indie-rock band Walking Sleep. With her September 2010 fourth solo album release, Four, it was time she returned to her true passion – writing and recording her own music. With her upcoming fifth solo record, Same Sun Shines, Radle displays her full versatility as a musician by playing every instrument on the record, including guitars, drums, piano, and violin. She also entered new territory by engineering and mixing the record’s collection of ten infectious pop songs herself. Same Sun Shines continues Radle’s diary-entry lyrical style, using a mix of honesty, heart, humor, and bite to tell stories of love, loss, relationships, and even death. From intimate moments with scaled down instrumentation, to fully orchestrated arrangements that have you questioning how one person was able to make a recording that sounds as full as a room of musicians playing together, every song on Same Sun Shines reflects Radle’s unique signature style that mixes rock, 50’s and 60’s pop, Americana, punk, and classic country. The latter is apparent on her cover of Mamas Don’t Let Your Babies Grow Up To Be Cowboys, a song made famous by Waylon Jennings and Willie Nelson. The Same Sun Shines version features big guitars and driving drums, and Radle in a duet with legendary indie singer/songwriter Mary Lou Lord.